Note: This is a review I wrote shortly after I discovered B.R. 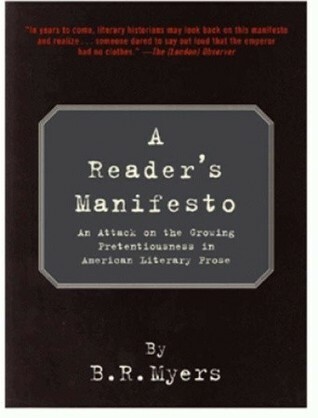 Myers’s book a few years after its publication following its appearance in a heavily truncated form in the Atlantic Monthly. It was a breath of fresh air then, and still is, though I’ve had many an argument with people who passionately object to its premise, sometimes even before they have read either the book or the essay. It’s that very passion, so reminiscent of a common religious or political mentality, that suggests to me that Myers, if nothing else, must be onto something. I leave it to you to decide if I’m right. Even “good guys” like Michael Dirda of the Washington Post Book World came down against the “Manifesto” and on the side of the literary establishment–a cabal of reviewers, university apparatchiks and traditional editors and publishers who glommed onto a French idea about art and for the last four or five decades have run with it as far as their pension portfolios will take them. The current crop divides fiction writing into two kinds: literary and genre, by which they mean books that conform to their strict standard of a plotless narrative in which language is presented more or less for its own sake, versus old-fashioned story-telling in which plot counts and there is a set of reasonably interesting characters. How the state of things literary got to be this way does not preoccupy Myers at great length, but the consequences, in his opinion as well as in the opinion of many ordinary readers to whom I personally showed a copy of his essay, are nothing short of disastrous for anyone who enjoys a good read in the sense that Somerset Maugham or Charles Dickens or Anthony Trollope, or even on occasion John O’Hara and Bud Schulberg, are good reads. The invective hurled against Myers after the publication of the original essay was so broad and so bitter that, even without possessing a wide knowledge of the field one cannot help but think he must be on to something. He recounts an instance in which a New York editor refused to ride on the same elevator after discovering Myers was on board. And he suggests that Judith Shulevitz, erstwhile mainstay of the New York Times Book Review‘s back page, telephoned him allegedly to conduct an interview but really for the purpose of gathering information to use against him in an upcoming essay. This kind of down-and-dirty behavior, along with many other instances he alleges of maliciousness and petty vindictiveness, indicates more than a mere difference of opinion about literary ideas. Those reviewers and editors were apparently wounded deeply where it hurts the most–in their articles of faith. In the Manifesto—it is hardly long enough to be called a book, not by the standard of today’s 500- or 700-page tomes–Myers investigates five of the current darlings of the literary establishment: Annie Proulx, Cormac McCarthy, Paul Auster, David Guterson and Don DeLillo. Using the same excerpts from their novels previously quoted by gushing reviewers, he dares to ask if what we are dealing with is not only not literary in any traditional sense of the word but questions whether it is even readable prose. Along the way, Myers–along with his readers, unless they are already converts to the same faith-based mentality as most of the major reviewers and their mentors in academia–has a lot of fun deflating the intellectual afflatus and demonstrating “the best prose stylist[s] working in English now, bar none” to be very naked, flabby and frequently flatulent emperors who, even as they continue to turn such praise into cold cash, probably know in their hearts that they are doing so on false pretenses. Myers has been received much more sympathetically in Great Britain. One suspects this is partly a question of the Brits getting their own back after so many years of shadowing the American intellectual establishment. I noted that within a year of the publication of Myers’s essay the Booker Prize committee announced—you could almost hear the sigh of relief all the way across the Atlantic–that in the future novels more “accessible” to ordinary readers would be emphasized over their less readable, literary cousins. Score one for the revolution. This doesn’t, of course, mean Myers is the last word on the subject. That decision should only be made by the individual reader—or in today’s publishing lingo, “consumer”—which is all that Myers is asking. But a very literate friend of mine who managed to collect a number of books by the authors Myers takes on—Snow Falling on Cedars, The Shipping News, All the Pretty Horses, among others—and never was able to finish any of them, after reading Myers’s essay collected them in a pile and put them out on the sidewalk for anyone to pick up. An hour later they were gone. It would be interesting to know how many of those books were then read with more enjoyment than they were by their original owner. In a publishing environment where authors are vetted for their photo- and telegenic qualities, where doing good stand-up in chain bookstores counts for more than writing prose that gives enough pleasure that readers want to read and re-read it, where authorial brand names mean as much—or as little–as they do for canned peaches or the latest designer jeans, maybe it shouldn’t seem odd that authors are packaged and marketed by conglomerates more adept at producing canned fruit and dry goods than good fiction. And maybe it shouldn’t surprise us that critics and academics sing the latest lit-tune the way ten-year-olds hum the McDonald jingle. But maybe the reign of literary doublespeak has gone as far as it can go and B.R. Myers has sounded a reveille for us to take back what properly belongs to us “common readers” and not to the literary commissariat that has for so long, and so disastrously, claimed it as its own. Britain may have responded more sympathetically to Myers’ article, but my husband and I have been bemoaning the wretched quality of recent offerings on the Booker prize short list. I agree with you a 100%, though, that the response to Myers by the officialdom of publishing suggests a deep unacknowledged threat. I have learned to recognize that response in myself as the secret door to that most difficult of all our hidden secrets: self-knowledge. Especially self-knowledge about those things I dislike/fear most in others. It is inevitably lurking there in my own heart. It sounds distressingly like fundamentalism everywhere, doesn’t it? It’s not limited to religion. It shows up in science, in the arts, in business. It masquerades so often as “principles,” but in my experience it is most often fear that makes it impossible for us to look at another point of view that may challenge our own. Do you feel you can recommend any recent novels? Thank you for the best wishes for 2012. As far as I can tell, at the very least it promises to be a humdinger!